The Boston Celtics are running out of time to resolve the numerous issues that afflict their roster, writes Sky Sports NBA analyst Mark Deeks. The Boston Celtics come into tonight's game against the Charlotte Hornets on a two-game losing streak. True, those two games were against quality opposition. The first game was a 115-104 loss to the Denver Nuggets, a legitimate title contender with enviable depth; last time out, a colossal 37-point, 22-rebound effort by Joel Embiid was the reason for a tight three-point loss on the road to the Philadelphia 76ers. These were not bad losses. However, they were losses nonetheless. And they speak to the legitimate concerns about how deep this Celtics team can go in the postseason. Expectations were lofty coming into the season, and quite rightly. The Celtics won 55 regular-season games last year and made the Eastern Conference Finals for the second time in a row, losing to the Cleveland Cavaliers in seven games only due to a game seven shooting drought (7-39 from three-point range) that was almost as profound as the one that also cost the Houston Rockets an NBA Finals spot against the Golden State Warriors out west. They did this despite not having All-Star forward Gordon Hayward for more than the first five minutes of the season. With such a high-calibre reinforcement rejoining the team, plus the return of all the core players that got them to that level after the re-signing of Aron Baynes and Marcus Smart, it followed logically that this year's Celtics would be better than last. With a 43-29 record currently, the Celtics have more losses already this season than the entirety of last. And things are not heading in the right direction. At the time of writing, the Celtics have lost seven of their last 13 games, with all but one loss coming against playoff opposition, and all but one win coming against lottery teams. The exceptions to those rules offset each other - an otherwise heartening 33-point win over the defending champion Golden State Warriors is cancelled out by a 10-point loss to the lottery-bound Chicago Bulls. Of course, going into the playoffs in a rich vein of form is no guarantee of success within them, as the 76ers proved last season. 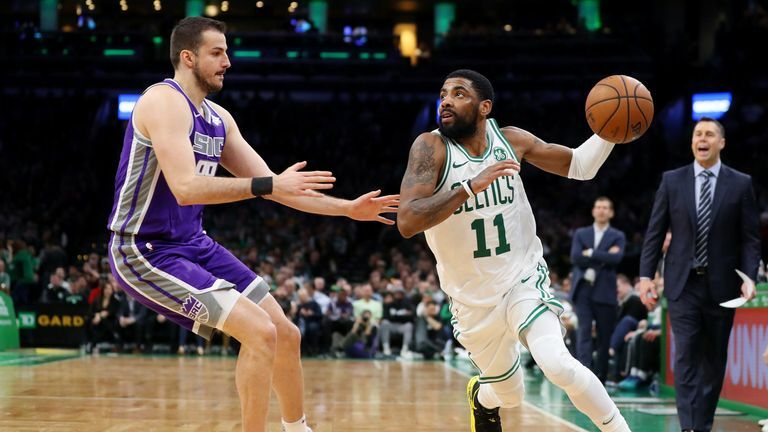 Closing out the regular season on a 16-game winning streak did not prevent them from throwing away multiple games in their eventual 4-1 second-round loss to the self-same Celtics with poor late-game execution. What does need to be seen, however, is improvement throughout the season. And yet that has not been the case. The loss to the 76ers was Philadelphia's only victory against the Celtics this year, with Boston winning the regular-season series 3-1. 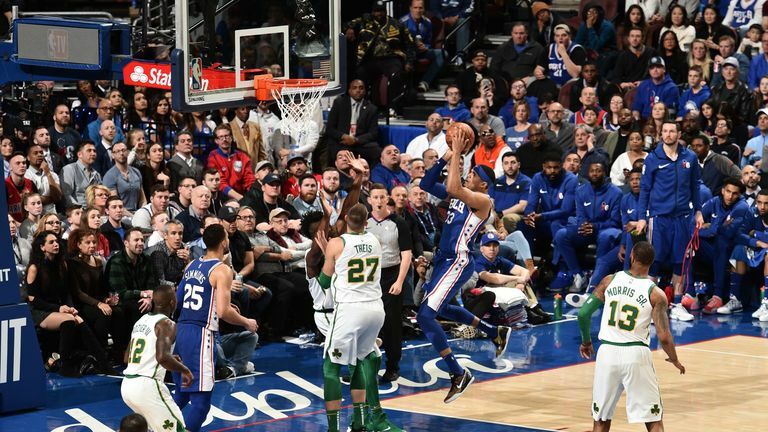 To an optimist, then, there is cause here to feel confident about this likely second-round rematch, especially given that it took an elite individual performance and an anomalous free-throw disparity for the 76ers to pull out the narrow home win. Al Horford, normally, is a tough match-up for Embiid, and given their own substantial roster turnover and urgent need to still make all their moving parts cohere, the 76ers are not exactly cooking on gas themselves. There are, however, enough reasons to be worried about the cohesion of the Celtics' roster as well. Hayward, simply, is not even close to the player he used to be. His basic-season averages of 10.8 points, 4.3 rebounds and 3.4 assists per game are not too bad, but "not too bad" is not enough here. Hayward's lift has gone, his dynamism has gone, his shot has gone, and although his efficiency has picked up over the last couple of months, his overall impact barely has. A shadow of his former self right now, Hayward is a decent seventh man, not a returning All-Star. The young wing duo of Jayson Tatum and Jaylen Brown have not made the leaps expected and/or required of them, either. Brown's improvements to his jump shot in the second half of last season saw him come into this campaign overly favouring it, being too aggressive offensively early in the clock in a way symptomatic of the overall team around him, and all too often neglecting the full-court freight train game that made him so effective last season. Also struggling to understand who he truly is, is the sophomore Tatum, whose excellent scoring efficiency last season has decreased this year as he attempts to prove he can be an isolation-based wing scorer. All he has proved instead is that he is not yet that player. Marcus Smart has been much-improved this season as a whole, but his tendency to get involved in any sort of fracas (as well as start many of them) can see him implode on any given night. For all of Al Horford's skills and smarts, he is starting to slow down in his 12th NBA season, and has required delicate management of his workload all season long given his troubled knee. His back-up, Aron Baynes, has been even more injury-prone. Daniel Theis has been somewhat effective in the reserve big role, but in having so many players determined to prove themselves as go-to perimeter scorers, the Celtics as a team are barely getting to the foul line, with the second-worst free-throw frequency in the league. And as Embiid and the 76ers proved, this can become an exploitable game-changing weakness. Reportedly, the Celtics are also not having the best time with each other's company. Kyrie Irving's free agency hangs over the team, as does the knowledge that the team's brain trust would have dealt half of the team for Anthony Davis of the New Orleans Pelicans last month had a little-known Collective Bargaining Agreement stipulation not prevented it. It is surely hard to feel too connected to a team that wishes to openly upgrade you. Kyrie openly bristling at the topic of his own future and the increasingly-prevalent group-think that he is off to the New York Knicks this summer adds a sense of foreboding to whatever the Celtics do this season, and, to some, it appears as though Irving is playing for his next contract. So too may be Marcus Morris, whose offensive aggression despite a lack of physical prowess is not new for him, but is often inefficient. Terry Rozier, meanwhile, definitely is, seemingly buoyed by his success as a spot starter last season and pressing way too hard now whenever he comes in off the bench. The 'Disease of More' normally only kicks in when a team has actually won something; the Celtics, it currently appears, have already lost their appetite. Amid the various points of contention, it should be remembered that this Celtics team is still supremely talented. A front eight of Kyrie Irving, Jayson Tatum, Gordon Hayward, Marcus Morris, Jaylen Brown, Al Horford, Marcus Smart and Terry Rozier is a heck of a front eight. But basketball was specifically devised to be a team game, built on principles designed to maximise teamwork over individual excellence. The Celtics have three short weeks to relearn that.